Josée Auclair is one of the most knowledgeable world wide Arctic guide. She was born on 2 May 1962 at Sherbrooke, Québec. She lives now at Cunningham Inlet on Somerset Island, Nunavut with her husband the world renowned explorer Richard Weber, and their two sons, Tessum and Nansen. Josée started skiing at the age of ten and competing at fourteen. She was a member of Canada's National Cross Country Ski Team. Josée has a bachelor degree in botany from the University of Vermont and a teaching certificate from the University of Quebec. Josée has traveled extensively in the arctic since 1988. She has skied five times to the North Pole. Her wonderful 'taking care of' attitude has earned her the nick name of "Polar Mum" She has become renowned for the delicious home cooked food that she prepares for each of the North Pole and arctic trips. 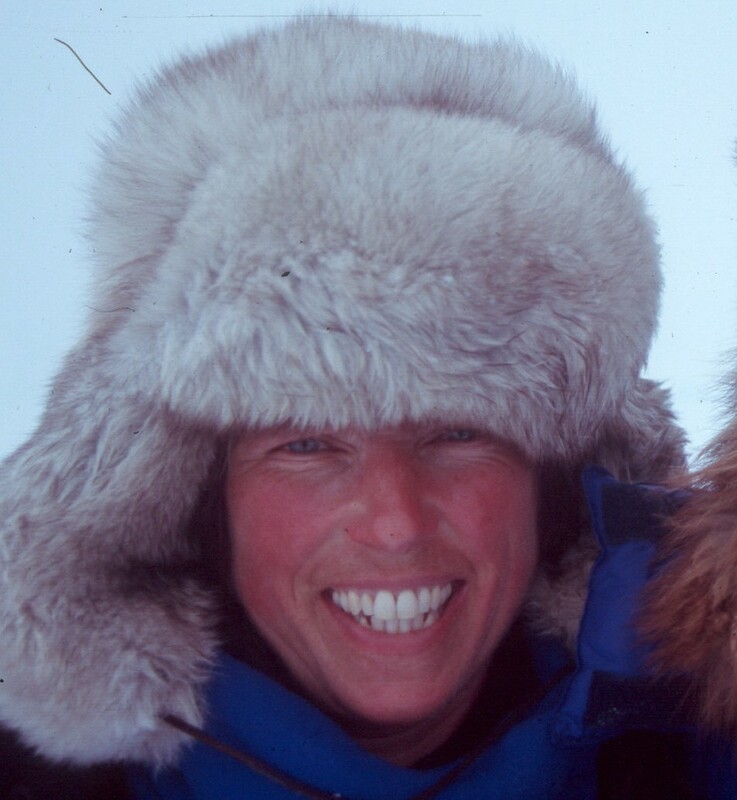 In April 2001, Josée led the all women trek to the North Pole - Women Quest 2001. The team featured a diverse group of women who traveled the last degree to the pole on skis, in sub zero conditions to the top of the planet at True North. As the leader of the group, Josée was responsible for ensuring that the team made it safely to the pole. This marked the first time that an all women group has reached the pole from a Russian based departure. After spending so many expeditions up North, she looked South and decided to lead la similar "all women trek" in Antarctica, covering the last degree of latitude to the South Pole. Josée is well known across the Canadian Arctic, particularly in Nunavut. She is a leaders in tourism and specialists in North Pole and northern logistics.Since 2000, 500 miles north of the Arctic Circle, amongst creeks and canyons, estuaries and icebergs, at Cunningham Inlet on Somerset Island, Nunavut, Josée is managing Arctic Watch Lodge, the most northerly wilderness lodge in the world. Broughton Island to Clyde River, Baffin Island, April 1987 : dog sled and ski expedition - 400 km. Penny Ice Cap, Auyuittuq National Park, Baffin Island, August 1988 : pioneered a new route from Okoa Bay to Glacier Lake across the Penny Ice Cap - 150 km. Chlorophylle Expedition, Pond Inlet, July 1989 :Â sea kayaking and film making in the Pond Inlet region. Pond Inlet, July 1990 :Â Hiking south east of the community of Pond Inlet. Frobisher Bay Kayak, July 1996 : Gold Cove region. Milne Inlet, Baffin Island, August 1996 : Camping, hiking in the region of Milne Inlet, North Baffin. Ellesmere Island, May 1997 : Ski expedition from Lake Hazen to Ward Hunt Island -250 km. Climbed Mount Arrowhead (first summited by Dr. JR Weber in 1956). Frobisher Bay, July 1997 : Spent a two months with Inuit family at outpost camp in Gold Cove. Ellesmere to Greenland, May 1998 : Ski expedition from Ellesmere Island across Kane Basin to Siorapaluk, Greenland - 300 km. Jackman Sound, July - August 1998 : Established a tourist camp in Jackman Sound for hiking, kayaking, wildlife viewing. North Pole Dash, April 1999 : Commercial "last degree" North Pole expedition from Russia, Assistant Guide with Richard Weber. North Pole Dash, April 2000 : Commercial "last degree" North Pole expedition from Russia, Assistant Guide with Richard Weber. North Pole Dash, April 2001 : Commercial "last degree" North Pole expedition from Russia, Guided a team of 10 women to the Pole. North Pole Dash, April 2003 : Commercial "last degree" North Pole expedition from Svalbard, Assistant Guide with Richard Weber. North Pole Dash, April 2004 : Commercial "last degree" North Pole expedition from Svalbard, Assistant Guide with Richard Weber. North Pole 2006 : Guided a group of 6 clients with an assistant guide, from the North Pole to 88Âº 50'. South Pole 2007 : All woman - last degree expedition to the South Pole.